The Candlestick X-Ray™ is the most comprehensive, feature-rich collection of candlestick pattern Indicators on the commercial market. Whether you're interested in the most common or advanced patterns — the Indicator, PaintBar, and Scanner detect over 90 unique candlestick patterns — significantly more than any other indicator or software. 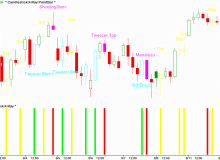 Want to scan for ANY candlestick pattern, on ANY timeframe, across ANY list of symbols? The Candlestick X-Ray™ gives you the power to scan for the best candlestick patterns and trade setups! Other candlestick pattern indicators use incorrect formulas. The Candlestick X-Ray™ outperforms all competitors by using strictly coded, Fibonacci-based formulas that filter out low-quality patterns. This ensures that only the strongest candlestick patterns are detected — avoiding weak, unreliable patterns that plague other software and indicators. Other candlestick tools on the market lack a proper understanding of the rules behind each pattern — resulting in incorrect formulas. This can have disastrous consequences if you're making trading decisions based on false patterns. To solve this problem, we devised each pattern's formula after studying all the candlestick-related literature that we could get our hands on. Since many candlestick patterns and their respective formulas are neither qualitatively defined nor uniformly agreed amongst candlestick "experts", we have combined their various interpretations to determine the specific rules for each pattern. We also went a step further to incorporate Fibonacci numbers and ratios into many of our formulas — creating multi-faceted, extremely powerful candlestick pattern Indicators. 92 candlestick patterns — significantly more than any other candlestick-related indicator or software. Nothing else comes close. Our strictly coded, Fibonacci-based formulas filter out low-quality patterns. This ensures that only the strongest candlestick patterns are detected — avoiding weak, unreliable patterns that plague other software and indicators. 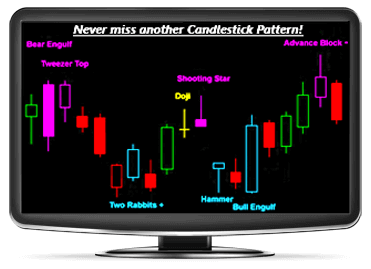 The most important aspect of any candlestick pattern software is the ability to scan for patterns and signals. You will receive specialized “scanner’ Indicators and templates, designed to scan any list of symbols for any and all candlestick patterns. Enable or disable any of the candlestick patterns to reduce chart clutter and be notified of only your favorite patterns. All colors and text labels are also fully customizable to give you complete control. Optional alerts and notifications ensure that you won’t miss any candlestick patterns or signals. You can easily configure audio, visual, and email alerts as well! 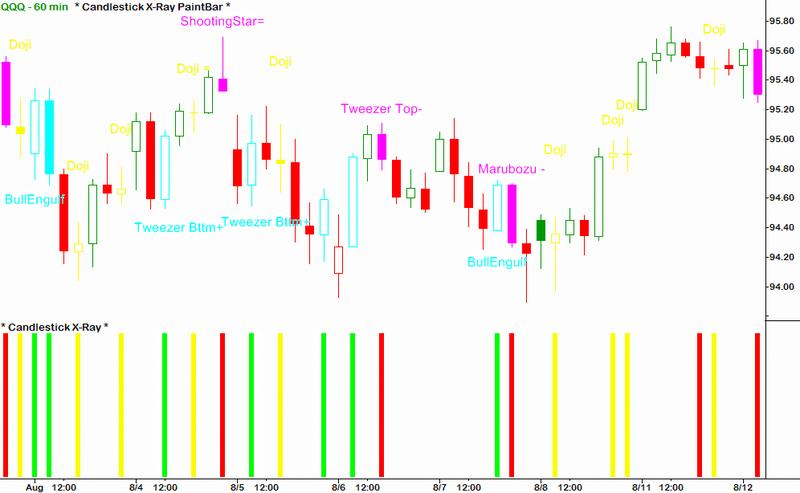 The Candlestick X-Ray PaintBar color-codes price bars and provides a text label of the pattern name whenever a valid candlestick pattern is detected. It is fully customizable, so you can display all the patterns or only the specific patterns that you're interested in. The Candlestick X-Ray Indicator plots color-coded bars in the subpanel when a valid candlestick pattern is detected. It’s a bit less obtrusive than the PaintBar Indicator and can easily be customized to display all patterns or only the specific patterns that you want to see. The Candlestick X-Ray™ Indicator Package also includes a special "Scanner" Indicator designed to scan for ANY candlestick pattern using the NinjaTrader Market Analyzer, TradeStation RadarScreen, or MultiCharts Market Scanner. And all columns, colors, and text are fully customizable! As you can see in the screenshots below, using the Candlestick X-Ray™ with the NinjaTrader Market Analyzer, TradeStation RadarScreen, or MultiCharts Market Scanner allows you to scan for candlestick patterns across any list of symbols — in just seconds! Have a question about the Candlestick X-Ray™ Indicator Package? Check out the Candlestick X-Ray™ User Guide to learn more! Surprisingly enough, there really aren’t many options for candlestick pattern indicators. I’ve seen a few others that don’t have nearly as many patterns as your Candlestick X-Ray, yet they still cost more for some reason. Yours is the most complete package by far. For years I’ve wanted an indicator that would let me run scans at the end of each trading day for all of the candlestick patterns. This is exactly what I was looking for and then some. I am so excited by what I can now do with these candlestick indicators. Thank you! I’m a beginner when it comes to candlestick patterns and I didn’t know that this many patterns existed. I’ve been brushing up on my candlestick research so I can interpret what all the patterns mean and your X-Ray has been so helpful for me to learn. Thank you for answering all my questions. I really appreciate it. 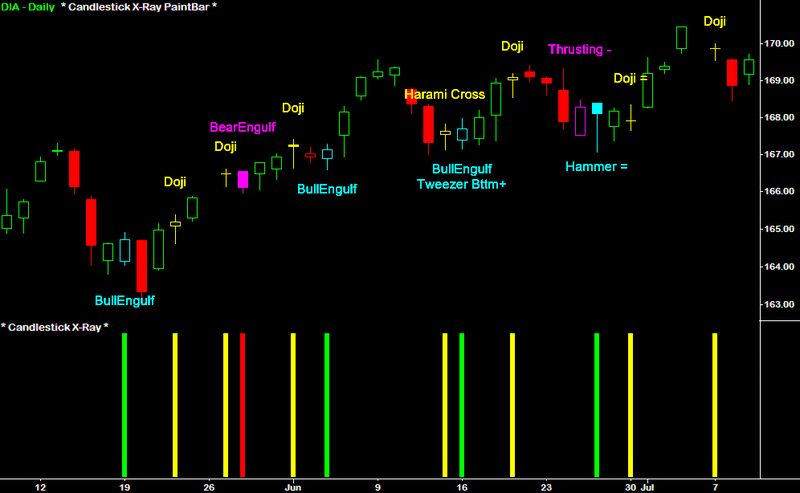 The text labels and paintbar are perfect for identifying specific candlestick patterns. I was concerned about having too many text labels so being able to enable or disable each pattern is a perfect solution. 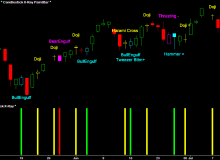 I don’t think there could be a better way than this for identifying candlestick patterns. After reading your user guide, I've also noticed that some of the candlestick “experts” have different rules for a number of patterns so I like how you based your indicators on the multiple teachings. If I had to rely on only one indicator, it would be one that can locate and scan for any candlestick pattern. I'm very happy to have found your site and the Candlestick X-Ray because it has really simplified my trading for the better. What is the most valuable feature of the Candlestick X-Ray™ Indicators? The Candlestick X-Ray™ Indicators are simply the most comprehensive candlestick pattern Indicators that you will find on the commercial market – at a fraction of the cost of inferior software. No other candlestick Indicators can compare to the number of different patterns, features or ease of use provided by the Candlestick X-Ray™ Indicators. Having an Indicator, PaintBar and a specialized Scanner version of the Indicators gives traders a complete and permanent solution to all their candlestick pattern needs. - We have also implemented solutions for common mistakes that are made by virtually all other candlestick pattern Indicators, in addition to incorporating the Fibonacci ratio into our formulas and providing ‘perfect’ versions of certain patterns that can have either strict or loose formulas. - Furthermore, all of candlestick patterns use the correct formulas. That being said, there is actually some minor disagreement on the conditions required for certain patterns. Our solution was to use a hybrid blend of the required criteria, based on the opinions of the two leading candlestick experts. Not only are our candlestick Indicators superior to all others - our candlestick formulas are too. The Candlestick X-Ray™ Indicators work best when price movements differ in size from one price bar to the next. Alternative chart types that have the same size bars or that plot synthetic price data will generate false signals or a lack of variety of signals. You can absolutely use the Candlestick X-Ray™ Indicators on a 1-minute chart, though you will find that signals are much more accurate and meaningful as the timeframe increases. Many candlestick patterns are only expected to ‘work’ for 1-3 bars, so a candlestick pattern on a 5 minute chart is a much less significant signal than the same signal on a 60-minute, daily, or weekly chart. Provide high probability reversals with expanding volatility and explosive price action. Often coincide with significantly overbought / oversold conditions, signaling that trend momentum is markedly waning. Often coincide with significant turning points in market character, reflecting drastic changes in price action (e.g. March 6th, 2009). Provide extraordinary risk / reward ratios. Provide high probability reversal patterns. The Candlestick X-Ray™ Indicators include built-in alerts for each and every single pattern so that you will be able to select exactly which ones you want to be notified of via audio, visual, or email alerts. How do I scan a list of symbols for candlestick patterns? The Candlestick X-Ray™ Indicator Package includes a specialized scanner Indicator that is designed to be used with the Market Analyzer (NinjaTrader), RadarScreen (TradeStation), or Market Scanner (MultiCharts). You'll also receive fully configured templates and workspaces so that you can begin scanning for signals and trend conditions immediately! How can I use the Candlestick X-Ray™ Indicators in my own strategies and codes? The Candlestick X-Ray™ Indicators can be used in your own custom strategies and Indicators by purchasing the “Candlestick X-Ray™ User Functions”, which are sold separately for $195 (half the cost of the Indicator Package). * You must own the Candlestick X-Ray™ Indicator Package to use the Functions since they reference the Indicators. What other Indicators do you recommend using in combination with the Candlestick X-Ray™? The Candlestick X-Ray™ Package contains the most comprehensive candlestick pattern Indicators available, making it a perfect complement to all other technical Indicators. The Candlestick X-Ray™ Indicators can be paired with any of our other Indicator Packages to increase the effectiveness of both — Vol.T™: Volume-Tick Indicators, Trend-Traffic™, Super MACD™, Super DMI™, Super Stochastics™, Super CCI™, and ZMA™.